Whenever an article is published about human ancestors, I always read it with my bigfoot goggles on, meaning that I look for connections to sasquatches. 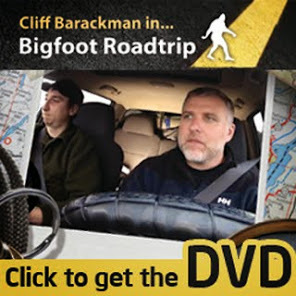 I strongly suspect that bigfoots are humans' closest living relatives (although I leave plenty of room for other hypothetical species of bigfoot-like critters from other parts of the world), and if this is true it makes sense that we can learn about sasquatches by learning about humans. Right now, bonobos and chimps hold the title of our closest cousins. Since chimpanzees and humans share nearly 96% of their DNA sequence, it should be expected that sasquatches would be right in that ballpark too, if not even closer in relation. The following article caught my eye, not only because of the human ancestor connection, but also because it mentions cross-breeding. The anthropological community (which you are a part of if you're interested in apes, humans, sasquatches, and the connections between them) will be hearing a lot more about cross-breeding in the coming years, so start brushing up on it now. who lived in central Asia about 40,000 years ago. left fingerprints in some humans' DNA. Neanderthals need to make room for a new kid sister in the early human family. By sequencing the full genome of a girl's fossil finger bone found in a Siberian cave, researchers conclude that there must have been a closely related sister group of Neanderthals living in central Asia about 40,000 years ago. The data also show that, like Neanderthals, the mysterious group interbred with modern humans, in this case leaving behind a genetic fingerprint in modern-day Melanesians of Papua New Guinea and Bougainville Island, nearly 10,000 kilometers (6,213 miles) from where the fossil was found. The new genetic information, reported Dec. 23 in Nature, underscores the fluidity of human evolution and hints that even more groups are waiting to be uncovered [emphasis added by Cliff], says paleoanthropologist Milford Wolpoff of the University of Michigan in Ann Arbor. "We're just scraping the outside of what's probably a much more complex picture." Thanks for writing this awesome post. It is a subject I find extremely fascinating about interbreeding and the effects on diseases and heritable traits. If we can find out that, say, Parkinson's is related to our neanderthal selves, then DNA studies could help prove what potential diseases you might get if you have Neanderthal DNA. It also says something about how closely related we were because in the creature world, similar beasts can mate, but create infertile offspring like Ligers and the offspring of horses and burros. That different ages of man lived together at any given time is intriguing, as well. It makes me wonder if there are variations here on earth that we aren't aware are actually another level of human evolution that is a subtle change. I read recently about the NAS brochure makes it look like the fossils that are found document macro-evolution. But Niles Eldredge, an evolutionist, biologist and paleontologist, says that the fossil record shows not a gradual change of creatures, but long periods of time where little to no evolutionary change shows up in most species. Wonder how the evolution theory holds up then? They proved it is not true by trying to prove it is true..I have a theory on the more complex picture referenced above, and it is probably not at all what most people would think. It would kind of lead to reveal whether Sasquatches were real or not too.